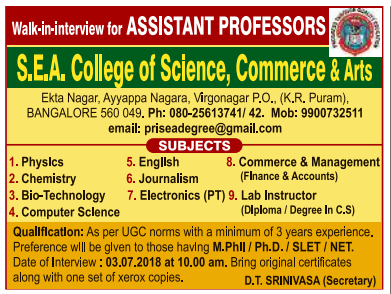 S.E.A College of Science Commerce and Arts, Bangalore has advertised in the DECCAN HERALD newspaper for the recruitment of Assistant Professor Plus Non-Faculty jobs vacancies. Interested and eligible job aspirants are requested to walk-in on 03rd July 2018. Check out further more details below. About College: S.E.A Education Trust runs a number of Educational Institutions offering education starting from pre school to advanced levels of graduate and post graduate programmes in Arts, Science, Commerce, Education, Management, Engineering and Paramedical disciplines to learners community belonging to various strata of the society, irrespective of their caste, creed and religion at the most affordable costs. All the Institutions/Programmes offered by the Trust are recognized by the competent Academic Administrative Bodies of our State/GOI and the Trust is taking giant strides to be a predominant member on the Global Education Sector as a provider of quality education in the cited specialized disciplines of primary and higher education levels. M.A/M.Sc/M.Phil with UGC NET/SLET (As per UGC norms). Minimum three years of experience is required.